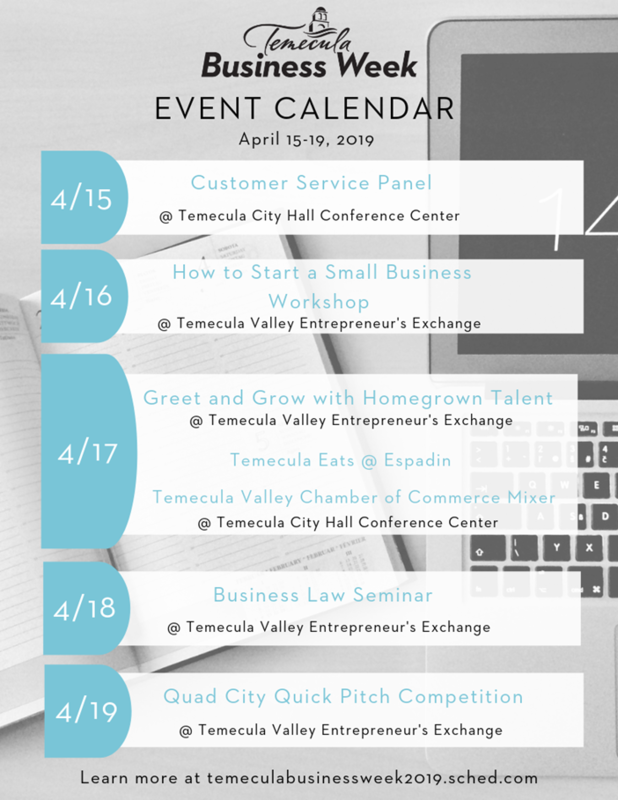 Temecula Business Week, April 15th – April 19th, 2019. The City of Temecula’s Economic Development Department presents this free, five-day event dedicated to providing ALL businesses – big and small – with the necessary skills, resources, and support to develop, grow, and thrive. With business licenses fees as low as $39 and no utility sales tax, Kosmont-Rose Institute ranked Temecula as one of the Top 20 least expensive cities in California to do business with. Businesses are attracted to the City of Temecula for a number of reasons including its highly skilled labor force, top notch K-12 school systems, proximity to San Diego, Los Angeles, and Orange Counties, affordable housing and exceptional quality of life. If you’re a current or prospective business owner, an entrepreneur, or an employee who wants to learn more about business concepts and strategies, the City of Temecula wants you to get involved! At Temecula Business Week, you will have the opportunity to attend a customer service panel, network with local entrepreneurs and Chamber members, put your pitch to the test, and much more. Each of these free events are led by local entrepreneurs, such as Jim Toth, Owner of Chick-fil-A Temecula and Emily Falappino, General Manager of Stryder Transportation. Don’t let this opportunity pass you by! Stay up to date on everything Temecula Business Week by following our Facebook and Instagram pages (@TemeculaBusinessWeek). For more detailed information and to register, please visit temeculaca.gov/businessweek.